Last year, New York City Council Speaker Melissa Mark-Viverito unveiled her plan for a fund that would cover bail for poor individuals charged with low-level criminal offenses who would otherwise be forced to wait in a city jail for their court date. The Council dedicated $1.4 million of budget funds to back the project, which is nearing launch. The program, if successful, could not only keep hundreds of individuals from staying in jail because they can't afford bail, but also lead to the expansion of state law that oversees and licenses bail funds, allowing for more criminal charges to be covered and higher bails paid. The Council bail fund is going through a fairly lengthy process to get up and running, with no clear start date more than a year after the initiative was announced. Mark-Viverito recently said she expects it to be functional in the coming months, but that the bureaucratic process of getting licensed by state overseers takes time. The fund has just been approved as a not-for-profit charity by the state attorney general's office, the second in four key steps. A heightened sense of urgency around the bail plan has emerged after Mark-Viverito announced this year that she hopes it will be a key element of actualizing "the dream" of closing Rikers Island jails. About 10,000 people are currently held in Rikers Island and other city jails, most awaiting a court appearance after being arrested for a low-level, non-violent offense. Some have been in jail for weeks or months because they can't afford bail and the criminal justice system moves at a snail's pace. It is a situation that many, including Mark-Viverito, have decried with increasing intensity over the past two years. 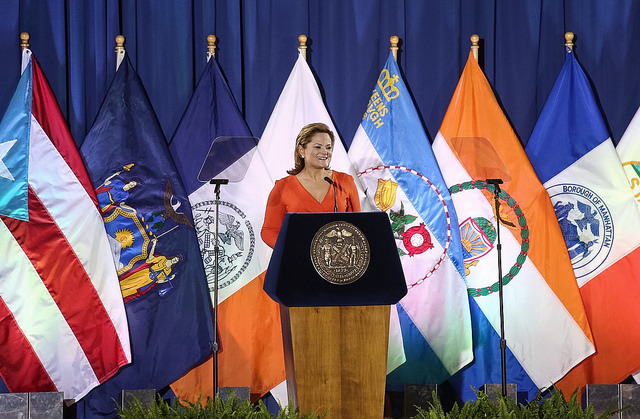 "We need to take a comprehensive approach to criminal justice reform that ensures a fairer system, improves police community relations, and addresses the fact that far too many of our young people – mostly low-income black and Latino males – are locked up at Rikers," Mark-Viverito said during her 2015 State of the City address. She continued: "For instance, if you are accused of jumping a turnstile or committing other minor offenses in New York City, you may be locked up. And if you can't afford bail you will spend on average 15 days in jail. The results are predictable: people lose their jobs, or their housing, and cannot take care of their children while they are in custody. These are people who are accused of minor offenses and are still considered innocent in the eyes of the law. This is not justice." 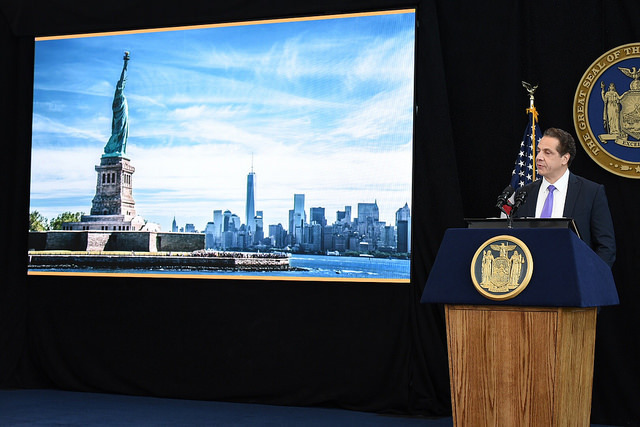 During this year's State of the City address, on Feb. 11, the speaker said that she wants to see "the population of Rikers to be so small that the dream of shutting it down becomes a reality." She announced a new criminal justice commission, led by former Chief Judge Jonathan Lippman, that will make recommendations for how to improve the criminal justice system. Last week while discussing her belief that Rikers Island should eventually be closed, Mark-Viverito cited her bail fund as something that will reduce the population over time. Asked when she expected the bail fund to start, Mark-Viverito said she is waiting to be licensed by the state. "We're waiting for the state, unfortunately, there's some state authorizations you need...some sort of licensure is needed," Mark-Viverito told reporters. "We needed, initially, a federal authorization, we've received that, we're waiting for the state, once that's done, we're ready to roll out. It's just we can't...without that authorization. So hopefully within the next months. It's just a normal process, obviously we are on top of it, but it's a normal process, it's bureaucratic." In follow-up conversation with Gotham Gazette, representatives of Mark-Viverito's office stressed the process is going well, is not an undue burden, and that the hope is to launch the program in a few months. The office said the process to incorporate the program began officially in July 2015. The first step involved registering as a non-profit on the federal level; the second, attorney general approval as a charity. With that second step complete, the application will go to the state Department of Financial Services, which licenses charitable bail funds. As approved by the AG, the fund shows "Initial directors" George McDonald, of The Doe Fund and David Howard, and Alphonso Wyatt, who were previously associated with the the fund. According to its bylaws, "The sole member of the Corporation shall be The Doe Fund, Inc., a New York not-for-profit corporation." McDonald is the founder and CEO of The Doe Fund, which has worked for decades to employ, house, and train homeless New Yorkers to help them stabilize their lives. According to the filing, "the purpose" of the new organization will be "to assist indigent defendents charged with low-level crimes avoid the experience, complications and related hardships of pretrial detention caused by their inability to afford bail." Once it becomes a bail fund, it will "provide bail assistance" and "research, analyze and document the effectiveness and social impact of" its activities. Before 2012 Mark-Viverito's bail fund wouldn't have needed state approval because charitable bail funds operated in a legal gray area. That year, Bronx state Senator Gustavo Rivera successfully advocated for a state law to oversee bail funds after a judge ordered an organization in his district to stop covering bail. Now, as bail funds grow in popularity, Rivera said he is working with the state Department of Financial Services to smooth the application process and guide smaller groups that are interested in opening funds. Rivera said that as the evidence of the efficacy of such programs grows he hopes to expand the law that now only covers misdemeanor offenses and has a cap of $2,000 bail. Rivera was approached by the Bronx Defenders (a nonprofit legal defense group) in 2010 shortly after he defeated disgraced then-Sen. Pedro Espada for his seat. When the bill passed in 2012, the Bronx Freedom Fund became the state's first licensed charitable bail fund. Since then the group has shown promising results, which Mark-Viverito and others have noticed. It released a study last year showing that 97 percent of its clients returned to all their court appearances - some to more than 15 dates in a row. The group says that 27 times its bail money was returned even before the conclusion of a case. Out of 188 cases, 62 percent ended in a dismissal of all charges, 22 percent in a violation that carries no record, and 12 percent with a misdemeanor plea and no jail time. The fund has $100,000 to pay bail and it is periodically replenished when their clients fulfill their court obligations. Individuals are interviewed by the fund to determine their eligibility. Alyssa Work, former director of the Freedom Fund, told Gotham Gazette last year that the application process involved a defendant filling out a form, and her checking to see if they have family and community ties or steady employment. She also would evaluate their criminal record. Rivera has held a two roundtables on bail funds and has heard some concerns from interested groups. "We've been tweaking the paperwork you have to go through to get people licensed as bondsmen," said Rivera. "We've been discussing having the application fee waived for certain smaller organizations that aren't flush with cash, some folks have found it difficult to find someone at [Department of Financial Services] to answer questions. But the most important thing is that we've been working with DFS on this all along and they've been very helpful." Organizations wishing to start a bail fund have to complete four major steps: register as a non-profit under federal tax laws; register as a charity under New York State law through the AG's office; obtain a charitable bail license from the state DFS; and, finally, obtain an individual bail bond license from DFS. Mark-Viverito's office is now on to the third step. Obtaining a charitable bail organization license from DFS requires a detailed application, a fee of $1,000, and the fingerprinting of all officers, directors, trustees, and executive personnel. Rivera said that while he intends to keep working with DFS on the application process, he does "hope to eventually introduce legislation that expands the legal parameters of bail funds." Rivera continued, "Right now the cap on bail is $2,000, we might want to move that. There is a small list of offenses currently covered and we may want to expand that list. We know we are helping people whose only crime is being poor, who can't afford bail, allowing them to be able to fight for their freedom, when they otherwise might be sitting in Rikers or somewhere else." In a statement to Gotham Gazette, Mark-Viverito said, "New York City is proud to lead the way in reforming a broken bail system that unjustly subjected our young people of color to senseless violence and abuse. By approaching this issue thoughtfully and deliberatively, we hope that our proposal for a citywide bail fund can serve as a model for other cities and municipalities seeking to change the way poverty and the criminal justice system intersect." Like Mark-Viverito, Sen. Rivera supports closing Rikers. Mayor Bill de Blasio called the idea "noble," but has said he doubts it is achievable. "My job is to level with the people of New York City," de Blasio recently told reporters. "This would cost billions and billions of dollars, be logistically very difficult, and we don't have the space right now." De Blasio has, however, also focused on bail reform, calling the current system unfair, with a burden that keeps the poor in jail for crimes they haven't been tried for, much less convicted of. De Blasio has a supervised release program scheduled to begin March 1. Funded by asset forfeiture funds from the Manhattan District Attorney's Office and the City Tax Levy, the program will provide judges with the option of sending those charged with misdemeanors or nonviolent felonies to supervised release programs overseen by agencies run in each of the five boroughs, rather than setting bail. The plan is expected to eventually serve 3,000 defendants. "There is a very real human cost to how our criminal justice system treats people while they wait for trial," de Blasio said in a July statement announcing the program. "Money bail is a problem because – as the system currently operates in New York – some people are being detained based on the size of their bank account, not the risk they pose. This is unacceptable. If people can be safely supervised in the community, they should be allowed to remain there regardless of their ability to pay."